Depending on where you live, the summer grilling season may be just around the corner. Some of you are lucky enough to live in a climate that allows for year-round grilling. Heck, here in Wisconsin there isn’t a true grilling season as there are several winter grilling warriors. A good friend of mine posted photos on Facebook last winter of his grilling adventures, complete with beer can stuck in a nearby snowbank. That’s just how we roll in a Wisconsin winter. So with the true grilling season about to start, I’m offering my top 13 tips on how to be a successful griller. I’m more about the technique, process, and how-to’s than anything. I’ll touch on a couple things related to how to prep the food, such as using an appropriate beer for the brats, but I’m mostly going to cover the Zen of being a Grillmaster General. These are my tried and true best practices for being a successful griller, and I know if you take even half this lesson to heart, your grilling will elevate to heights you previously dreamed about. Why I am qualified to offer tips? Well, first and foremost, I have a blog and keyboard at my disposal. Scratch that – actually I have years of experience using a variety of different grills. I was pretty young when my Dad first asked, “Hey, do you think you can watch and flip these burgers while I go get a plate?” From there I was hooked on grilling, and in time this student became the master. But it wasn’t without several flips, flops, and burnt burgers. Don’t let anyone take over while you run to the bathroom, play on your cell phone, grab a drink, etc. I learned this lesson the hard way – and unfortunately it took two separate instances for it to sink in. The first time I was hosting a party and left the grill unmanned while I ran to the bathroom. I got stopped on the way back and got caught up in conversation, then grabbed a beer to take back to the grill. What a huge mistake! Most of what was on the grill had started to get crispy, so we salvaged what we could. Success was in my grasp, but in a matter of minutes I stumbled (probably literally if I had been drinking) into the depths of failure. In my other example I asked a couple guys in my tailgating crew to flip burgers at the ballpark while I ran to the Port-o-Potty. I got stuck in line for quite a while and my buddies must have thought I meant to flip the burgers only once because when I returned everything was burnt. Yet it was my fault somehow. Funny how that works, huh? If you have to, use an alpha blocker or catheter while grilling – you have no excuse to use the bathroom!!! Beer goes in the pan to make beer brats, not in your mouth. I just touched on this in the above tip. I had been drinking beer in both those examples, and it led me to leave the grill to use the bathroom. Unless you have a Grillmaster General closer to take over along the lines of Trevor Hoffman or Mariano Rivera, you’d best stay put. Even better – don’t drink anything until the grilling is done. It all goes back to focus and if you really want to be elite, or repeatedly fail to close things out much like Carlos Marmol for the 2011 Chicago Cubs. Reward yourself with a cold one when your crew is slapping you on the back over a job well done. If you see tears in their eyes and it isn’t from the charcoal smoke, then it must be your awesome food. Cheers, my friend! The best beer for making beer brats is a cheap beer. Cheers indeed. Cheers for a cheap beer! Way back in the day I enjoyed Michelob, Special Export, and Samuel Adams. One problem with those beers – they sucked when it came to making beer brats! Since I couldn’t get the brats to taste quite right, I went the lazier route and started buying “beer brats” from Johnsonville. The Johnsonville ingredients list “Wisconsin beer” as the brew of choice. Well geez, that certainly narrows it down! Thankfully I didn’t stick with the store bought beer brats for long. I was grilling with my Dad one summer and he asked if I was going to make beer brats. “I think I have some Old Milwaukee,” he told me. Bingo! From there I discovered Hamms, Schiltz and Pabst were equally effective in giving the brats a nice well-rounded taste. A thirty pack of most of those beers costs something like nine or ten bucks, so you can’t go wrong. Either have a designated “closer” to take over the grill at the end so you can be freed up to load plates with food, or have someone else load the plates. Unless you’ve studied at the University of Weber-Grillmasters, there is no way you can do it all alone. If you are planning on being the designated griller for events, then that’s your focus. Get a qualified (and sober) individual to get the condiments, side items, and the table utensils out. This person should also be putting plates under your nose for you to load with your grilled delights. Don’t mix different meat on the same charcoal grill. Get two grills going at the same time, but they need to be close to one another. You can probably skip this tip if you have a gas grill, but if you’re using charcoal then you should certainly follow it. I don’t know how many times at a tailgate or cookout, Joe Schmoe showed up with his own chicken breasts or steak. It forced me to break this rule, and if I was really careful I could make it so their contribution didn’t intermingle with my brats or burgers on the same grill. But if you can avoid it, try not to put two different things on the same grill. I grilled asparagus for a friend one time that well, didn’t taste like asparagus when I was finished. It tasted a bit like hamburger from the grease! If you get more than one grill going they need to be close together so you don’t have to rush back and forth. If you’re tailgating at a game, dump the charcoal immediately after you’re finished grilling. 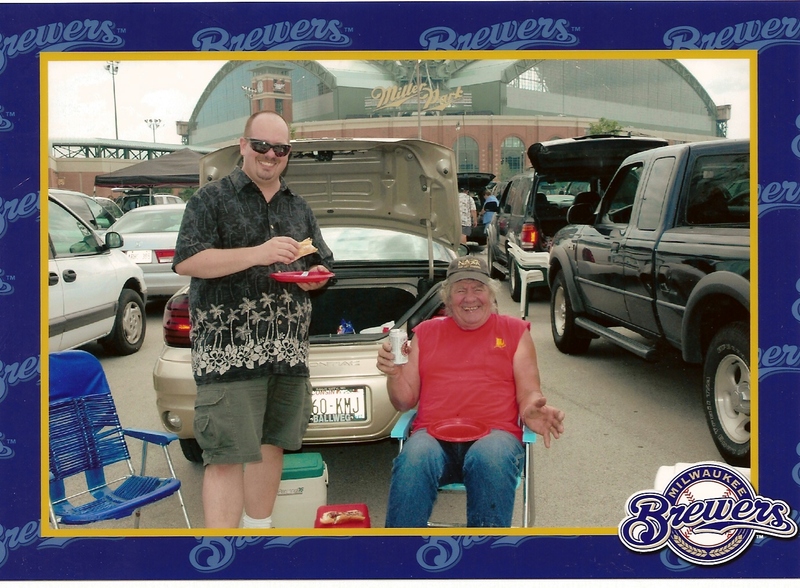 My Dad and I witnessed unspeakable horror at a Brewers game when I was a kid. Someone shoved a still lit charcoal grill into the back of their van. By the second inning we could see billowing smoke from beyond the bleachers at Milwaukee County Stadium. You don’t want to be that griller! If you dump the charcoal immediately, it allows time for the grill to cool down so you can put it away without fear of your vehicle blowing up. Oh, and don’t be lazy – dump the charcoal into the proper container. It just galls me to see hot coals in a regular trash can. Have someone load a plate for you while you do this – if you’re the griller then you’ve earned it. Practice shutting your mouth and breathing through your nose. 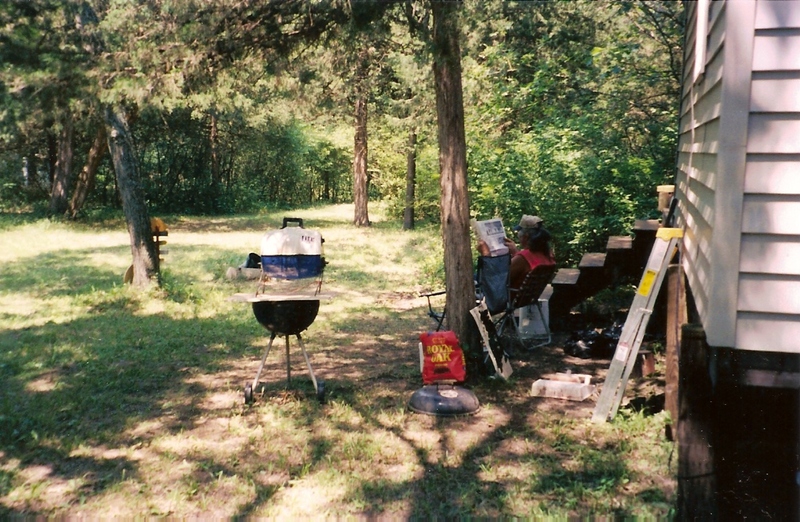 Let’s face it – if you’re using charcoal and there’s more than a 5 mph wind, you will smell like smoke! I have moved little by little all the way around a grill to no avail. The smoke seems to know you are trying to be the Grillmaster and will follow you. I know you’ll be tempted to turn your cap around, but don’t do it! The smoke is just messing with your Zen. Go into what I call the griller zone, shut your mouth, breathe through your nose – and WIPE THOSE TEARS FROM YOUR EYES! Make sure you have all the necessary utensils and grilling food ready before you even light the damn thing. I got burned (bad pun intended) by this many times when I first started grilling. You will start your climb toward mastering the art of grilling with organization. Triple check that you have everything – it’ll just save embarrassment in the long run. One time I had to schlep to the tailgaters next door to get matches. “You forgot the most important part,” one guy said. No, actually everything you need for grilling is an important part. Just make sure you have what you need ahead of time. There’s always a casualty. Let it go. Yet another lesson that took a while to settle in my thick head. I dropped a brat one time that wedged between the grill grate and the side wall. My Dad was beside me and said I should retrieve the brat, so I moved in but couldn’t get a good grip with the pinchers. Meanwhile the flames started coming up the side, and that made it even harder to get the brat back. At the same time things needed flipping and…you get the idea. It was like trying to fight a war on two fronts. I’ve dropped burgers on the ground and had brats roll right off the grill. Simply take a deep breath and let it go. There’s always a casualty. You just need to make sure you have enough food to cover your losses in battle. Don’t be afraid to try using a variety of different grill in your quest to become the best. 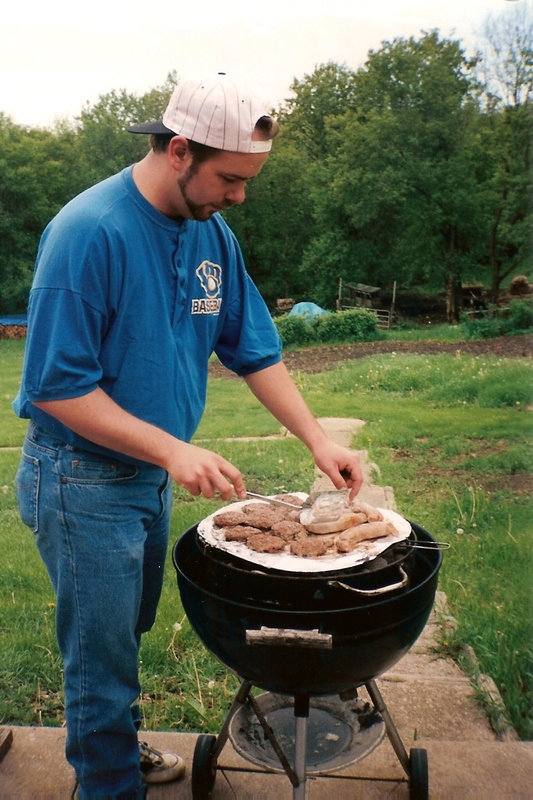 One of my first grills was a large circular thing on about four inch legs. My Dad would bring it to Milwaukee Brewers games for tailgating and it lasted for years. When he decided to pitch it and “upgrade” to something similar (new), I took it as my own. I found a garbage can lid and stuck it in the bottom as it was weakening from years of hot coals. You really needed a lot of patience with this grill because it required you to work from a crouch being so low to the ground. But it was possibly the best 10 bucks Dad ever spent. The lesson I learned from that grill and the several others that followed was that you must use a variety of grills to become a good griller. It’s important to be flexible and roll with the grill in front of you. I’ve been at parties and cookouts where I was nominated to grill on the spot. I just draw on my experience and go into the griller zone. I’m more of a charcoal guy and have owned everything from a Keg-a-Que to a Hibachi and gigantic Weber. Vary the grills and don’t be afraid to step up and be the designated griller – your experiences will take you far and I promise you’ll be the one that gets tapped to grill every time. According to the American Cancer Society, polycyclic aromatic hydrocarbons (PAHs) form when fat from meat drips onto the charcoal. They then rise with the smoke and can get deposited on the food. They can also form directly on the food as it is charred. The hotter the temperature and the longer the meat cooks, the more HCAs are formed. We’re talking cancer-causing agents here. Scary stuff, huh? I haven’t grilled on an actual bare charcoal grate in years, and always use the above tin foil tip. Am I completely safe from carcinogens and PAHs? Of course not. But I do notice a way less smoky taste in the meat and everything is less charred. Mix all the chopped food in a bowl. Throw in a few dashes of the seasoned salt to taste. Lay one piece of foil down on a flat surface. Spray with vegetable oil to prevent anything sticking to it. Cover the foil evenly with the vegetable mixture. Put a few tablespoon sized chunks of butter in various places within the vegetables (I usually do the four corners plus one in the middle). Then take the other piece of foil and put it on top of the vegetables. Crimp the pieces of foil together around the edges. Poke holes with a fork in the foil – on each side if possible. Place this on the grill. Some Tips: It’s hard to know at first how much stuff to cut up. If you have too much, you can always make a second pouch and place these side by side on a larger grill. Again, don’t make this too big. I used to make this for Dad on fishing trips and I had a terrible disaster when I first started trying to flip a huge pouch. It’ll be hot, but you can attempt to un-crimp and check the food about halfway through. This also helps for you to know when you should flip the pouch. This usually takes roughly 30-45 minutes on a grill that is going pretty good. Since I use charcoal I try not to create a raging inferno. Trust me – it doesn’t end well. Again, you’re looking at least 30 minutes depending on how your grill is going, weather conditions, pouch size, etc. Don’t start grilling other stuff that doesn’t take as long. First time I did this I made brats on another grill and they were done about a half hour before the veggie mix. Time it out so the main course is done the same time as this side dish. I’m sure several of you looked at the food items I use and thought, “Blecch…I HATE onions/carrots/broccoli or whatever.” Vary the stuff inside and don’t be afraid to experiment. I was at a tailgate party where the guy making this used peas and red potatoes and left out the carrots. I learned from my own attempts with white potatoes that reds cook faster, and personally I like the taste better. You can always make two pouches that appeal to different people. This makes an excellent grilled side dish that goes way beyond the standard chips/dip people come to expect at their cookouts. And you can make a completely veggie pouch for anyone looking for vegetarian options. Enjoy! There you have it. I’ve been called many things in my day, but some of the best nicknames are when someone calls me the Grillmaster General or Smoky Grills. I hope you give it your best shot this summer and take this pursuit seriously. Remember that with great grilling comes great responsibility. Best wishes for your success! P.S. If you enjoyed these tips and care to share, please use the “Share This Post” buttons below to post to your favorite social media sites. I appreciate it! A younger version of yours truly working on his craft. Hat to the back – correct. Mixing brats and burgers on the same grill – incorrect. I’m enjoying the fruits of my grilling labor and Dad is enjoying a cheap beer!